It has been said that demographics are destiny. Those familiar with the long sweep of human history could point to many examples of where even minor changes in a population, ushered in significant and radical changes in economics, society and other areas. For those tasked with anticipating the future, understanding where demographic trends are heading provides a powerful way of anticipating what is over the horizon more broadly and where opportunities might be. Fortunately, although in this rapidly changing world there are a few factors we can reliably predict, demographics can be more readily forecast. However, having the right assumptions, data and tools are necessary if we are to get the demographics – and the future – right. The national Census, conducted by the Australian Bureau of Statistics (ABS) every five years, is one of the most important tools for understanding our changing nation. The Census is the most wide-ranging examination into Australia’s population, covering a range of areas including age, household and family structure, education, employment, incomes and dwellings. The latest Census included over 68 million data points across 2.8 million tables. The Census is critical to understanding the residential real estate market. It places a spotlight on the shifts in Australia’s population and outlines what a future Australia will look like. With the last Census conducted in 2016 and the results released in stages throughout 2017, the beginning of 2018 is an opportune time to consider its key insights and implications more deeply. 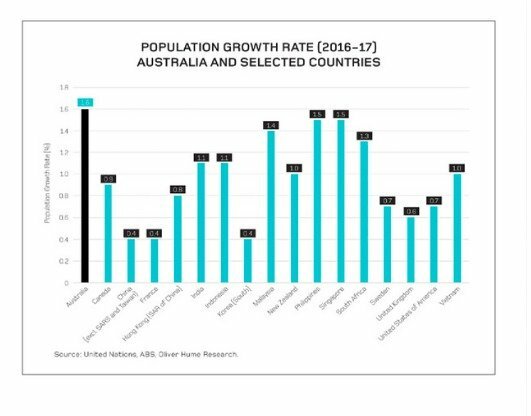 Australia’s changing population is driven partly by record population growth, now the highest in the developed world and faster than most of our neighbours. Australia’s population increased by around 1.9 million people to exceed 23 million from the 2011 to 2016 Census. At the end of June 2017, around the time of the Census data release, Australia’s population had already reached 24.6 million, growing by over 388,000 people (+1.6%) over the year. The Census highlights that 80% of Australia’s population was living increasingly on the eastern seaboard, with Melbourne and Sydney continuing to absorb most of the nation’s population growth. The shift east represents both a long-term trend and a more recent one with the end of the mining and resources boom, which saw employment prospects in the west diminish. These trends are continuing with Victoria recording the fastest growth rate of all states and territories in 2016-17 (+2.3%), followed by New South Wales and Queensland (both +1.6%). Over this period New South Wales and Victoria accounted for over 68% of the nation’s population growth with Victoria alone accounting for most of this at 37%. Over 70% of Australians now reside in cities and this share continues to grow as Australia undergoes urbanisation. Nearly 80% of Australia’s population growth occurred in our capital cities from 2011 to 2016, with growth in cities outstripping the rest of Australia at almost double the rate. The Census seemed to confirm that Melbourne will become Australia’s largest capital city with the southern capital’s population growing faster than Sydney. The Census also confirmed the fastest growing locations in Australia. 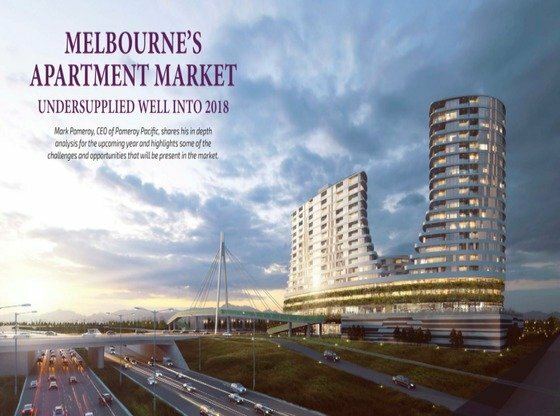 Many of the fastest growing locations were municipalities in Melbourne’s greenfield areas highlighting the significant national role played by this market in accommodating the Australia’s record population growth. The other key demographic trend the Census spotlighted was ageing and the shift to an older Australia. The median age of the Australian population continued to increase, rising from 37 years in 2011 to 38 years in 2016, and well above that observed over a century ago at the time of first national Census when the median age was 23 years in 1911. Most of this demographic shift occurred in the last 50 years due to the rise of the baby boomers with the median age in 1966 still only 28 years. But while the importance of the large baby boomer segment is well recognised, less well-known is the growth of other major population segments including the young adult population (20-34 years) and children aged 10 years and below. These cohorts are set to become increasingly important. Growth in the population aged 20-34 years has been driven by immigration, another key population trend, which has become increasingly important over the last two decades. Australia’s levels of immigration have been at record levels for several years. The share of Australians born overseas has risen in recent years with around one in four people in Australia born overseas as at the 2016 Census. 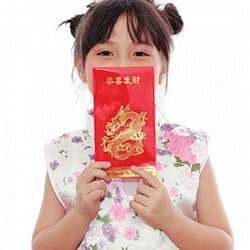 An increasing number of those born overseas were from Asia and especially China and India. 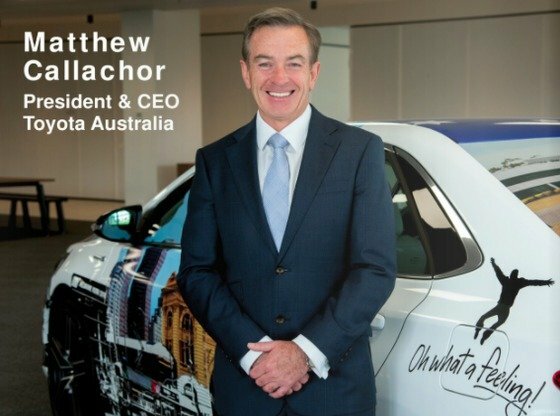 The share of Australians born overseas continues to grow reaching over 28% according to the most recent data released by the ABS. Following the Census data release, net overseas migration continued to increase, rising to over 245,000 people in 2016-17, an increase of 27% and contributing almost 63% of our population growth. The bulk of this immigration intake occurred across the eastern seaboard. In 2016-17, New South Wales and Victoria recorded their highest ever levels of net overseas migration (+98,600 and +86,900 respectively) surging above the previous high in 2008-09. A new record was set soon after with the ABS reporting that, in the year to September 2017, the number of permanent and long-term arrivals in Australia exceeded 777,000. This was the highest annual increase on record and more than double the long-term average since December 1976. Various trends, including ageing and immigration, are driving a transformation in Australia’s households and families. Although most of Australia’s households are occupied by families (69%), family households continue to decline in relative importance, decreasing from around 75% of all households in 1991. Of increasing importance are lone person households, now accounting for nearly 25% of all households, up from a fifth in 1991. Although couple families with children were the most common family type in 2016 (45%) the share has declined over the last 25 years (54% in 1991). In contrast, the share of couple families without children and single parent families has increased from less than a third (32%) in 1991 to nearly four out of ten (38%) in 2016. The growth in lone-person households and the significant changes in family composition types has been a key driver of declining household size. This is now just 2.6 people per household. These demographic changes have influenced people’s housing decisions and the property market. Although separate houses still represent the bulk of Australia’s housing stock the share of this dwelling types has declined from 76% in 2011 to 73% in 2016 of all households. Medium-density housing (including semi-detached, row housing, town houses, flats and apartments) has increased and now represents around 26% of all housing. A range of factors, but especially decreased affordability and immigration, has seen a shift in the relative importance of different tenure types. Over the last 25 years outright ownership has continued to decline falling from over 41% of all dwellings in 1991 to 31% in 2016. In contrast, the share of dwellings owned with a mortgage (from 28% to 35%) and rented (from 27% to 31%) rose over the quarter of a century from 1991 to 2016. Australia’s economy and employment base has also showed considerable change in recent years. The 2016 Census showed that Australia’s transition to a service-based knowledge economy was well underway with the health, education and training and professional, scientific and technical services industries amongst the largest and fastest growing areas of economic activity. The strongest employment growth over the period 2011 to 2016 occurred in the health care and social assistance industry (+153,900 or nearly +16%). This industry is now Australia’s largest employer accounting for over 12% of Australia’s working population (over 1.3 million workers). The education and training sector also accounted for significant jobs growth (over +104,000) reflecting a range of forces including our success in growing the international education sector. International education is now Australia’s largest service export and third largest export after iron ore and coal. Fuelled by a booming population, construction was also a key driver of employment growth accounting for a fifth of all new jobs and growing by +9.9%. Construction is the fourth largest employer providing jobs to over 910,000 people. Professional, scientific and technical services was our fifth largest industry in terms of employment, growing by +6.3% to reach an employment base of around 776,000. Employment growth patterns mirrored that of population growth in many cases. For example, Sydney and Melbourne recorded the strongest employment growth. Within cities, the 2016 Census also highlighted significant changes in the distribution of new jobs, driven by the growth of the knowledge economy and various advanced service-based industries including professional services. Professionals had the largest growth of occupation groups over the period 2011 to 2016, an increase of 225,000 jobs. The Census also showed that Australians were upskilling by pursuing higher education. 2016 was the first time the Census reported that most of the population aged 15+ across each jurisdiction had a post-school qualification. Around 56% of all Australians aged 15+ years (9.6 million people) had a post-school qualification (up from 46% in 2016). A university degree was the main post-school qualification with around a quarter having a Bachelor Degree or higher (up from 18% in 2006). Oliver Hume Corporation is one of Australia’s most reputable residential property funds and real estate services groups. For over 60 years, they have helped owner-occupiers and investors achieve their property and investment goals. Oliver Hume Property Funds manages high-quality property developments, with strong profit and return forecasts founded upon quality research and backed by an extensive, thorough and rigorous due diligence process. Important: The information in this document has been prepared a general guide only and does not constitute advice. We have relied upon information from sources generally regarded as authoritative. Whilst the information has been prepared in good faith and with due care, no representation is made in relation to the accuracy of the whole or any part of the publication. No liability for negligence or otherwise is assumed for any loss or damage suffered by any party resulting from their use of this publication. The whole or any part of this publication must not be mirrored, reproduced or copied, without written consent. The document may contain future forecasts of a range of variables, which can be affected by a significant number of unpredictable factors, including social and economic conditions. It only represents the best judgements and estimates, made by Oliver Hume Research. No assurances can be given that the forecasts will be achieved. This document should be read in conjunction with any other documentation prepared by the marketing agent and associated consultants.